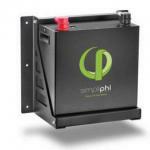 Portable foldable solar charging systems are available from 40w up to 200w. These portable foldable panels are a great way to maximise storage capacity of your RV or garage. They can be stored for extended periods of time and are easily deployed when the extra power is required for vacations or emergency backup power. When you arrive at your destination, the set up process takes less than 5 minutes. Unpack the bag/case, unfold the panels, adjust the tilt legs, set on the ground in a sunny location pointing south, and finally connect the wires to your battery. 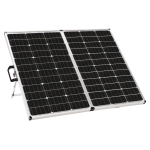 The two manufacturers we carry are from SolarlandUSA and Zamp Solar. 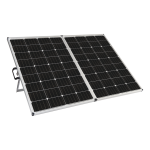 Both manufacturers have a great portable foldable solar panel product and we have summarized the main features of each manufacturer to help our customers choose the best model for their portable solar panel needs. 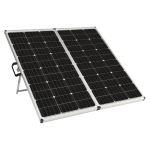 Solarland USA portable folding solar panel kits, have polycrystalline technology, are also ground mounted, have adjustable tilt legs and have built in charge controller, 16ft lead wire with battery clips for easy hook up and can be folded up and stored in a aluminum case. 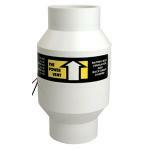 Warranty is 1 year on workmanship and 5 years on power output. Portable foldable solar panel kits provide 12 volt power for charging 12 volt batteries. 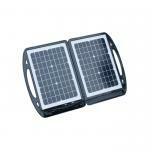 They are made up of two 12V solar panels that are hinged together so they can be folded together when not in use. 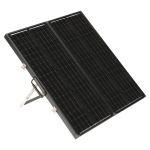 They have hinged legs attached to the back of the solar panels as well as a small solar regulator with connected power cables and battery clamps. the complete portable solar panel kit is held in a carry bag or case. 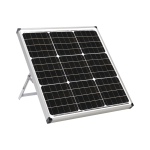 There are many sizes to choose from, you can enjoy the convenience of solar power when travelling and camping, so instead of attaching a solar panel to roof of your boat or RV where it is vulnerable to damage and theft, choose from our range of portable folding solar panels. 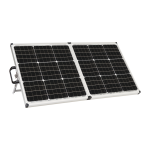 Whether you need a powerful 200W portable solar panel for the RV/ emergency back up or a compact 40W solar kit complete with carry bag and regulator you will find the size to meet your needs. You should use the current draw in amps to be more accurate. Let's calculate the amp-hours the solar kit will need to generate. Using the same example of the 15 watt light bulb we note that it consumes 1.25 amps so after six hours it will have drained 7.5 Amps from the battery that needs to be replaced every day. If you want a solar panel large enough to top up the battery in 5 hours of sun then it must generate 1.5 amps. Reading the electrical data for a 20 watt solar module shows the Maximum amps (Imp) is 1.2amps..not enough, so our previous calculation using watts gave incorrect data, Why? because the solar panel generates about 18 volts but we are only using about 14 volts to recharge the battery, the rest of the solar power is wasted. 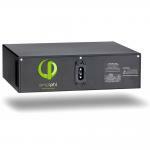 Using amps we see that we will need a larger solar panel, in this case a 30 watt solar panel with an Imp of 1.8 amps. 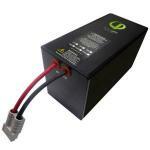 If you need a smaller solar charger to trickle charge large batteries then choose one of the 10 watt solar panels. Many standard 12V power car adapters for laptops and mobile phones will plug in to the portable solar kits with 12 sockets to allow you to use and recharge all your personal electronics car chargers or you use compact inverters to power small 120VAC appliances, inverters must be conected to a battery and cannot run direct from the solar panel.